The all-new SpectraLayers Pro 5. A completely overhauled space for sound. 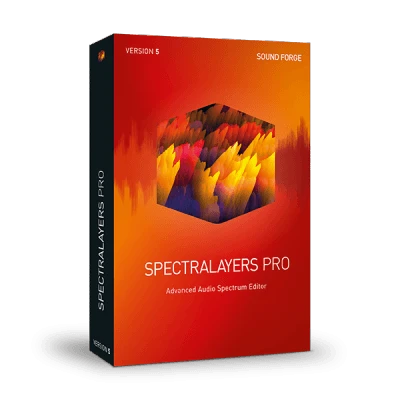 SpectraLayers Pro 5 offers unrivalled audio editing and sound design that you can not only hear but also see. Featuring unique spectral visualization of your sound, SpectraLayers Pro enables you to easily get to the heart and soul of your audio. Make precise edits, repair damaged artefacts and create unique audio designs. The brand new version has a redesigned interface for a smoother workflow, added tools for restoration and repair, and a high-resolution Spectrogram so you can see your audio like never before. New tools include Frequency Repair for assisted and specific frequency reconstruction, and Heal Action which is used to to reconstruct gaps in background ambience. A new Spectral Markers tool increases annotation options while the Brush settings have been redesigned for a more consistent experience, using screen pixels as the new default unit. All tool settings automatically save between sessions and are fully WYSIWYG (What You See Is What You Get) so edits are clearer and previews easier to make. The visual Spectrogram uses a brand new algorithm developed especially for SpectraLayers. It helps produce a new ultra high-resolution interface and reveals detail in your audio that you would never have seen previously. With adjustable Resolution and Sharpness settings, you are getting state of the art, precision editing and it's all still produced in real time. With its new high-definition Spectrogram, SpectraLayers Pro 5 offers many new options and features including both Time Sharpen and Frequency Sharpen. It also includes fine-tunable Frequency Resolution and Overlap settings, Cubic filtering, and a brand new Composite View mode that adds different color-mapping options for previewing your final mix. SpectraLayers Pro 5 includes a brand new Measure Area tool that lets you get detailed data about a specific segment of your spectral audio. Simply click and drag to specify your chosen area and you will get detailed information about it including loudness, average volume and so on. SpectraLayers Pro 5 features a new, slick and darker interface offering an easier workflow so you can focus more on the task at hand. The GUI features improved navigation and more logically grouped tools and settings. There are new Hybrid Slider Value inputs which can be be controlled by mouse, touch, number input or scroll wheel and Direct Wave sample editing. An even bigger toolkit for your sounds. Several new tools allow you to gain full control of the audio restoration process. The new Heal Action feature automatically fills gaps in an audio file by reconstructing the ambient background noise around it. If you have a dropout in an audio recording, Heal Action examines the audio on either side to rebuild the missing data. The Frequency Repair tool allows you to easily repair specific damaged frequencies using assisted frequency reconstruction and with full control over the process. Finally, Spectral Markers allow you to add and share annotations within the Spectrogram. The new High Definition Spectrogram Display. The high-definition Spectrogram display is the world’s first use of the new Fast Local Sharpening algorithm for high-resolution that enables pin-sharp accuracy - allowing you to perform precision edits in real time. The display has several adjustable parameters that really let you focus on specific details within your audio, including Wave Range, Time Range, 3D Range and fine-tunable Frequency Resolution and Overlap. See your final mix. Before it's final. The brand new Composite View mode in SpectraLayers Pro 5 offers a highly-customizable range of previews of your final mix with the complete dynamic range shown across the Spectrogram. It reveals all the layers merged together with adjustable color-mapping and a color gradient of your choice so you can easily customize the preview of your mix. You can still make edits in this mode and use all of the precision controls. Get to know your sound. Intimately. SpectraLayers Pro 5 features a brand new algorithm called Fast Local Sharpening, which brings revolutionary detail and precision viewing to the software. It was designed specifically for SpectraLayers Pro and unveiled at the 143rd AES Convention in New York. The results are unrivalled - super high-definition Spectrogram and features like Time Sharpen and Frequency Sharpen settings for high-precision editing.